The thermal properties of water are therapeutic because it helps increase circulation. The hydrostatic pressure of the water compresses the tissues causing decreased swelling, and improved lymphatic return. The buoyancy of the water helps to “un weight” the body and facilitate movement, with less stress on musculoskeletal system. Drag is a property of water that creates resistance to movement, facilitating strengthening of the musculoskeletal system. Patients with arthritis benefit from the being able to exercise in an environment where there is minimal stress on the joints, improved circulation, and facilitation of movement. Patients with joint replacement surgery benefit from the decreased stress on their joints, reduced swelling and facilitation of movement. Patients with low back pain benefit from the decreased stress on the back and relaxation of the water temperature. Patients with sports injuries benefit from performing exercises at a faster pace due to the reduced stress on the joints. 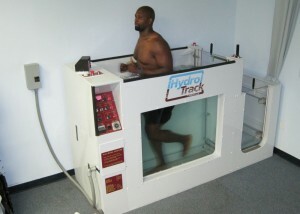 What are my aquatic rehabilitation options at The Sports Rehabilitation Center? After the initial physical therapy evaluation, treatment goals and the plan of care are established. Aquatic rehabilitation is intended to be a transition method used until patients can return to dry-land activities without increased pain or swelling. The physical therapist will help determine if aquatic therapy is indicated to meet your treatment goals. We use a pool and underwater treadmills at some of our locations to help return patients to their prior level of activity in the safest and most efficient way possible. To determine which type of aquatic therapy is available at a specific location, please call the individual office.